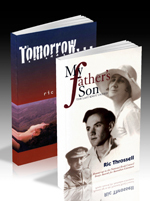 An autobiography, My Father's Son was runner-up in the National Book Council Banjo Awards for Australian Literature. It tells the story of Ric Throssell's long battle to break through the suspicion and prejudice that stifled his Foreign Affairs career as the result of being the son of a famous communist. In 1997, em PRESS published a revised edition, which includes a new final chapter that uncovers the information in top secret files held by ASIO on Throssell. Throssell claims the files clear him of any collusion in a secret 'spy-ring' during the Cold War. A book published in 2016 counters there is still evidence that Throssell was a spy for the Russians. Tomorrow begins with the flight of a young Polish Jew, Galina, from Nazi Europe to a new life in Australia. At university, she becomes friends with a cell of communists and it is through them that this epic novel traces the war against Japan and the fear and repression of Communism in the 1950s. Eventually, the failure of the revolution at home and abroad was to lead to disillusionment among a generation of Australian communists. Tomorrow never dawns. "A moving, romantic and often exciting account of a life scarred with grief and controversy, and healed with joy, love and vindication." "Tomorrow is a courageous novel. It is at times tender, frequently tense, and not without the pathos wrought by the bitterness of delusion. Quite apart from the quality of writing and sense of place which is evoked with considerable clarity, Tomorrow offers an insight into not only the operation of communism in Australia, but the people who were attracted to it as an idea." "An absorbing companion to emerging histories of the intelligence warfare conducted in Australia against Australian citizens and it goes a long way to answering some of the questions Throssell poses at the outset about the causes of faith 'too long sustained' in gods that proved false." Ric Throssell was the son of celebrated writer and communist Katharine Susannah Prichard and the Victoria Cross winner Hugo Throssell. He worked in the Department of Foreign Affairs for 40 years and served as the Director of the Commonwealth Foundation in London. He wrote three novels, non-fiction and a series of plays. He died in 1998, aged 76 years old.